Before yesterday afternoon I’d barely heard of Defiance, and had a vague impression it was a new game that I wouldn’t be interested in since I’m not a gamer at all. Thanks to +Tad Donaghe and the superb new iBook Defiance: The Essential Guide I now know this is an upcoming TV show, a game, and much more than that. 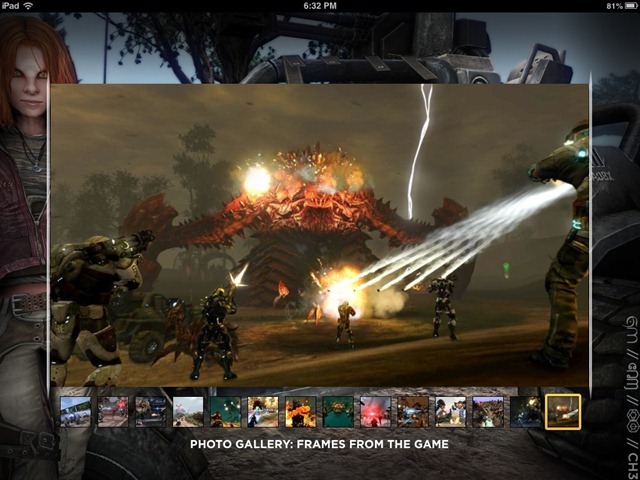 Defiance: The Essential Guide by Syfy and Trion Worlds is the perfect interactive companion to the groundbreaking TV series and the incredible multiplayer game. Set in the near future, Defiance introduces an exotically transformed planet Earth, its landscapes permanently altered following the sudden – and tumultuous – arrival of seven unique alien races. In this somewhat unknown and unpredictable landscape, the richly diverse, newly-formed civilization of humans and aliens must learn to co-exist peacefully. Each week, viewers will follow an immersive character drama set in the boom-town of Defiance, which sits atop the ruins of St. Louis, MO, while in the game, players will adventure in the new frontier of the San Francisco Bay area. The dramatic tapestry of the series and the intense action of the game will exist in a single universe where their respective narratives will inform one another and evolve together into one overall story. That last point is one of the most interesting and unique aspects of Defiance, and it’s talked about a lot in the opening chapter of the iBook. The huge amount of ‘interconnectivity’ between the TV show and the game is highlighted. The weekly TV show affects the game – and how you play the game just might change what happens on the show … Events in the show will impact the game, and events in the game will impact the show – creating an unprecedented interactive experience. 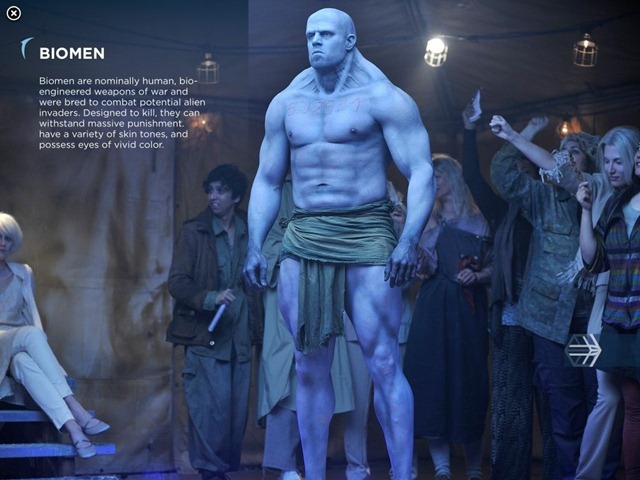 Chapter 2 – Defiance: The Characters: The town of Defiance is described as a melting pot of humans and aliens – and a number of different alien cultures. This chapter provides introductions to many of the leading characters. 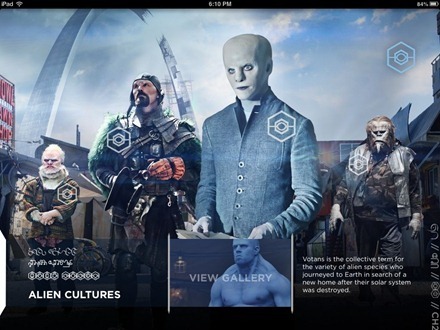 In-page video clips offer more detail on characters and on things like the makeup for the various different alien races, and the various alien languages. There’s a full interactive page devoted just to the alien cultures. It looks like an excellent range of characters, human and alien. Chapter 3 – Defiance: United. Divided. Defiant. Join the Fight: This chapter is all about Defiance the game. 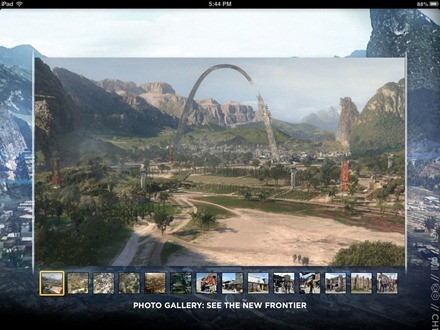 It’s an MMO and will be launched on the Xbox 360, Playstation 3, and PC. 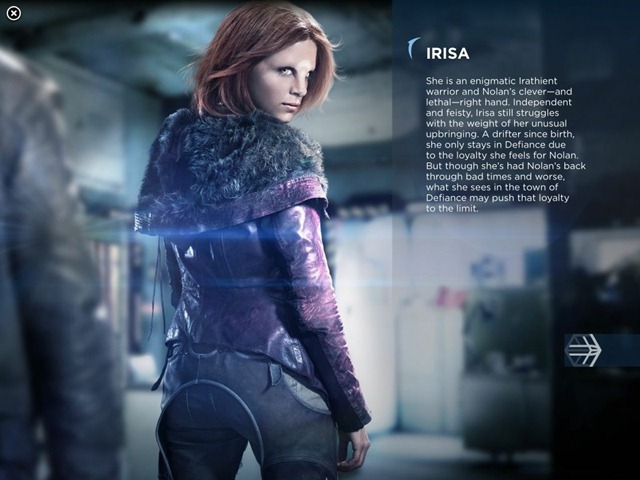 There are video overviews of the game with its creators discussing it in depth, profiles of some of the notable characters in the game as well as some of the enemies you’ll face, and a photo gallery with frames from the game. And of course there’s a game trailer video – which looks great even to a total non-gamer like me. 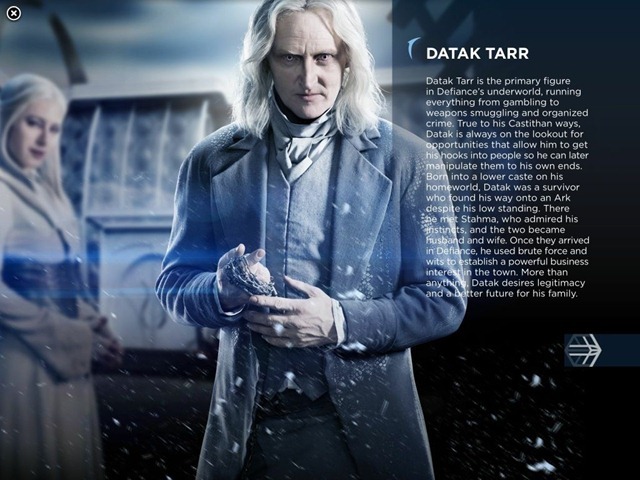 Chapter 4 – Defiance Behind the Scenes: An extensive look at the writing, production, cinematography, music, sets and environments, and cast. Chapter 5 – Bonus Material: This chapter includes a scene from the premier episode, check out the alphabets for 3 alien languages and a Votan/Human translator, lots of links to Defiance resources (Facebook page for show/game, Tumblr, YouTube channels, Twitter, iTunes to download episodes, and podcasts) and postcards to share on Facebook and Twitter. The book’s pages are full of interactive and multimedia elements – and it supports AirPlay so you can watch videos up on a big TV with Apple TV. The photo galleries are pretty spectacular too – I started out with something crazy like 50 screenshots and had to work hard to trim them down for this post. The TV show looks fantastic, I can’t think of too many shows I’ve been looking forward to as much. This iBook lives up to the ‘essential guide’ portion of its name nicely. 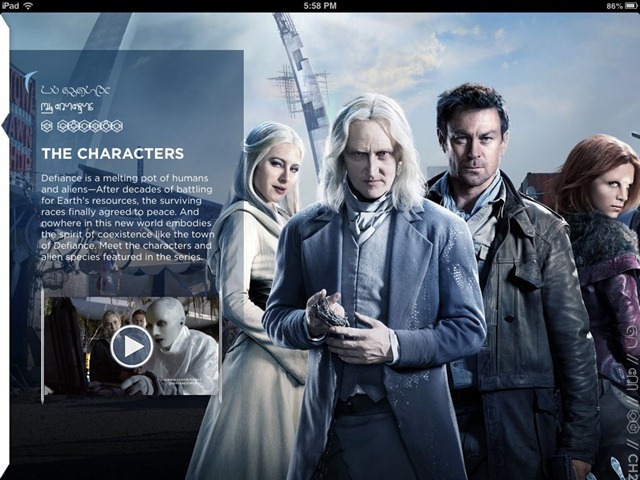 It could easily have been released as an app – and should serve as a great primer for anyone who is even vaguely interested in either Defiance the TV show or the game. The TV show debuts on Monday April 15. Check out the Defiance.com site for lots of useful links to buy the game and more. 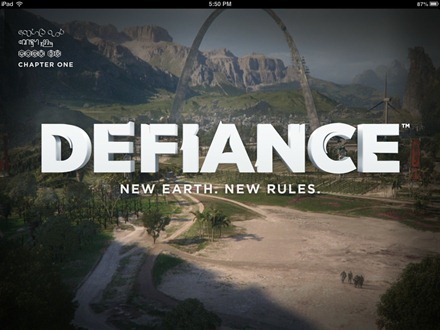 Here’s an iBookstore link for Defiance: The Essential Guide; it’s a free book.